I've had a borrowed copy of this book on my shelf for about 2 years. Last month I was gifted a copy ina swap and it was the push I needed to finally read this celebrated novel. I am not sure why I procrastinated so long - I devoured it in a little over a day. 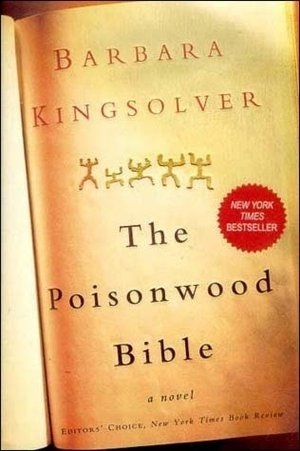 The Poisonwood Bible is the story of a misguided Evangelical preacher who drags his wife and 4 daughters to the Congo in the 1960s to work as a missionary. Naive, unprepared and blinded by righteousness the family struggles to survive in their new found home while around them the country is in political turmoil as the Congo seeks independence from Belgium. The story is told from multiple viewpoints - something I often struggle with in 'epic' type novels - but here it works well with each woman having a distinct voice. I particularly looked forward to Adah's chapters with her clever word play and her insightful observations which she was unable to verbalize . At times though the characters feel a little like over emphasized caricatures - the doormat wife, the tomboy, the cripple, the innocent, the airhead. Particularly Rachel - unwittingly providing the comic relief in what is otherwise a bleak and pessimistic novel - her self absorbed view of the world and her ironic misuse of words is funny to begin with but does grate by the end of the book. Whilst I most enjoyed the descriptions of daily life in a Congolese village, I also loved how each woman chose her own path out of the Congo and how these choices were followed decades later providing an insight into how 18months in the village shaped each of their lives. Kingsolver doesnt pull any punches and the excesses and political interference of the West (particularly the US) are not glossed over. Kingsolver's political views are fairly clear and perhaps this will be a turn off for some - I appreciated that she shared her viewpoint and took on a subject as complex as this. It is an eye opener - a unflinching one at that, and at times it made me feel ashamed and uncomfortable - reading this book with a full stomach while there is no clear solution to right all the wrongs (still) happening in Africa.